For some free games you can download on your computer check out the Happy Note link on the right. My 2 favorites games are "Treble Clef and Bass Clef" (teaches letter names of notes on the staff) and Music Notes in space (teaches names of the notes - quarter, half, whole). My students love to play the "Breakout" game because it is fun, but they don't seem to learn as much from it. I found the idea for this game several years ago on Martha Beth Lewis's piano site. she has so many great ideas for teaching piano to young beginners. To find a very detailed explanation of this game go to Martha Beth Lewis's piano site and read her article on teaching lines and spaces. It also includes many other fun activities to help your child learn to play the piano. Following is a brief version. · Make a staff on the floor with your five pieces of yarn (lines). Decide where you want the bottom (low end) of the staff to be. Pretend you are a note and play “Simon Says” using the following ideas. A space note fills the space. A line note has a line going through it. Call out actions for students and see who can keep from falling as in the regular game of Twister. Students can compete against each other to see who can stay up the longest or play solo and see how many commands they can peform correctly before falling. - Put your chin on a middle line note, etc. To help reinforce the concept of stepping up and down the staff try this fun game. Materials: M&Ms, one grand staff for dimes card for every player. A die or spinner. Each player starts with an m&m (dime, skittle or other round candy)and places it on the bottom line of the bass clef. Players take turn rolling the die and moving their candies up the staff by steps (line, space, line, space, etc.). Whoever reaches the top line of Treble Staff first gets to eat their candy (or keep their dime). You could also practice stepping down by starting at the top of the staff and moving down by steps instead. Today at preschool to introduce the grand staff we made art pictures and glued "wagon wheel" pasta on every line and space on the staff. Children often don't visualize the "spaces" on the staff and think of notes moving from one line to the next line. To help them remember to see the spaces we also had "races in the spaces" by imagining the spaces as lanes on a race track. We then scooted our wagon wheels along the spaces in the staff. For more reinforcement of lines and spaces on the staff check out the fun variations of the staff on Susan Paradis's website link on the right. Under her games tab you'll find the following free printables: Candy Corn Staff, Staff for Dimes, Peppermint Notes and Jewel Notes. When children are exposed to a great variety of music, they tend to play the piano more expressivly. To listen to some samples of various dances from "The Nutcracker" click on the Starfall link and Check out Tchaikovsky's jukebox in the "It's fun to read" music section. Last week at preschool I introduced the treble & bass clefs with this fun game. The kids loved it and wanted to keep on playing it. First the students each stood on a colored felt "spot" on the floor. 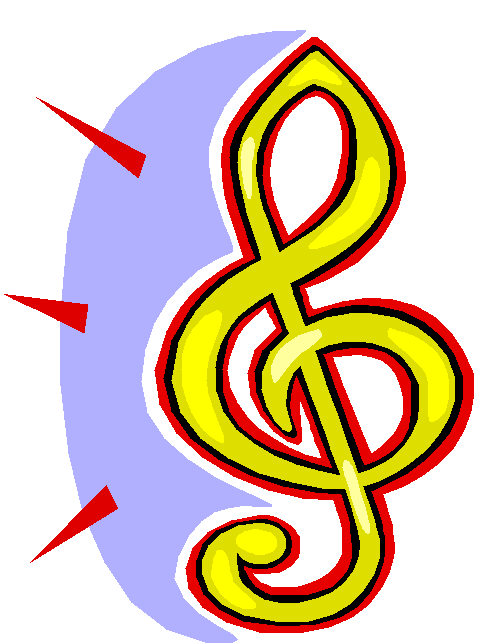 Then I set a picture of a bass clef or a treble clef next to each spot. As we listened to the "Queen Treble Clef, King Bass Clef" song the kids walked around from spot to spot. When I stopped the music at random times the students raced to "act out" which clef they were standing by. Bass Clefs crouched down low to the ground to represent the low sounds in the bass clef, while the treble clefs jumped up high to represent high notes. They also named their clefs using the correct voice - High pitched Treble Clef/Low pitched Bass Clef. The students took turns playing the high (treble) and low (bass) notes at the piano to match the words of the song. Playing the piano becomes very motivating when kids learn to play familiar songs. I can still remember when I learned a song by Beethoven that I had listened to on one of my dad's records for years. It made me feel like I was a "real" pianist. For a fun way to review finger #'s, print out a simple of version of Jingle Bells at the Phonics 4 Piano website. This song is written just for the right hand. You can also try playing it on the "computer" piano by clicking on the "online fun" tab on their site. 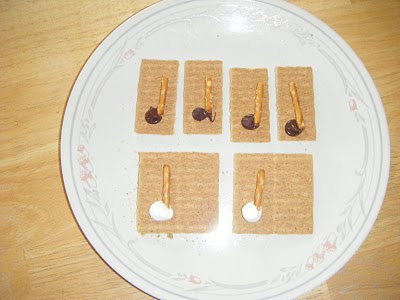 To introduce note values to my students I use graham crackers, chocolate chips and marshmallows. The grahams are already conveniently divided into 4 sections. Each rectangle represents one beat. Then we add the chocolate chips and pretzels to make quarter notes on one cracker or marshmallows & pretzels to make half notes on 2 crackers. This helps kids visualize that half notes are bigger and therefore longer. Once they have successfully "clapped" the rhythm on their crackers, then they get to eat them. Click on the music learning community link to play this quick game to review quarter notes and half notes. It may be a challenge for some young students to control the mouse quickly enough, so you can have them point to the correct answer on the screen or call it out while you click on it. Check out this fun game on the Music Learning Community link to introduce the white keys CDE to your child. I introduce "D" first by having them find the 2 black key groups and saying this little rhyme - "Hey Diddle Diddle, the D's in the middle." Another fun way is to call the 2 black keys the Doghouse and tell them that the "D" for Dog lives inside, but for young preschoolers who may not associate D with Dog yet, this analogy won't be very effective. I was surprised at how much my preschoolers loved this familiar song. It helps them improve their sense of rhythm and large motor skills. Check out this video on Youtube for a demo. This fun Halloween song from Susan Paradis's website (see link on the right) helps young beginners clearly distinguish between up & down stem notes. Try tapping the correct hand for the notes (down stems left, up stems right)to help. Say the hand as you tap...ex: left, left left, right: left, left left, etc. Once this is mastered they can tap finger #'s off the piano and then try it on the keys. I discovered this fun music website for kids. Some of the material is geared towards "readers" several of the activities even young beginners could try. The "Radio" has many short clips from Classical Music. Try having your child listen to different samples and ask them to draw a picture of what the music makes them think of. When children can associate music with pictures, stories or emotions they end up being more expressive performers. The "Performalator" in the Music Lab can reinforce concepts of reading from left to right. It also reinforces the idea for children that notes high on the page are high on the keyboard, low on the page are low on the keyboard. Although it doesn't involve true music reading, kids can have fun "playing" familiar tunes on the keys like Twinkle Twinkle & Row Row Your Boat. Click on the Faber Piano Adventures site at the right to watch a demonstration of this song. Often I like to introduce songs to preschoolers by first doing a larger body movement as they listen to it. For this one we pretended to be whales on the ground and swayed our "tails" to the rhythm. This song comes from a Hap Palmer "Baby Songs-ABCs" video. My daughter loves all of their videos which we frequently check out at the local library. Even though they are a bit dated, they have fun "activity" songs for preschoolers. The songs are well-written with easy "catchy" tunes. For this particular song, kids get two sticks (spoons, pens, wands, shoes etc.) and tap them together "Tap your sticks to the right with a 1,2,3; Tap your sticks to the left with a 1,2,3..." with several variations like tap your sticks on the ground, hammer left with the right...etc. It helps them improve their sense of beat, encourages singing & helps them improve their coordination and listening skills. To help my students learn piano (soft) and forte (loud), I played different excerpts from Classical music while they danced. When the music stopped they had to freeze & hold up a pianomouse sign (mouse picture w/ a piano symbol on it) or a fortelion sign (lion sign w/ a forte symbol on it) to show me what the music sounded like. They loved this activity, especially the "freeze" part! I love to reading and music so sing-a-long books are some of my favorites because they help my kids be more musical and better readers at the same time. Singing also helps children improve their sense of rhythm and aural memory. Sometimes I tap the rhythm of the song below the words on the page or bounce them on my lap to the beat or rhythm of the song. At the Portneuf Library I found "Piggies" by Don & Audrey Wood. The illustrations are adorable and very captivating for young children. I made up my own melody while reading it and changed the words a bit to help review finger #s. Ex: "I've got two fat little piggies" sitting on finger ___. (one). I have the students wiggle the fingers the piggies are sitting on and say the corresponding finger # on each page where they introduce new "piggies." Then at the end of the book they "put them all together, all in a row" & tap thumbs together, then 2nd fingers, 3rd fingers, etc. The Boy on the Bus by Penny Dale - This is a fun variation of wheels on the bus. The Itsy Bitsy Spider by Iza Trapani - Trapani has a lot of sing-a-long books that have additional verses to the traditional songs. Click on her name to see more. You can find a lot of these at the library too. Brown Bear, Brown Bear What do you see? by Eric Carle -the library has a music cd to go along with this favorite book that they use at storytime- but unfortunately it isn't available for checkout. Do you have any other sing-a-long books that your kids enjoy? This song is excellent for reinforcing the concept of a steady beat because the key words/actions always fall on the beat. If you have a keyboard with a metronome function or a metronome try having your child match the beat of the metronome - start very slow (40 beats per minute) and work up to 200. Teaching concepts with a song makes it a lot more memorable and can also be a clever "less threatening" way provide correction when needed. I made a giant keyboard by drawing piano keys on an old sheet (a vinyl tablecloth would work even better). We do the hokey pokey with a little piano twist. It seems to take little kids a while to figure out the difference between left and right. Each time I have them hold out their hands flat and look for the capital L in the left hand before we start. That's what its all about." I adapted this traditional song to meet my piano teaching purposes. There are two variations. With young children it is beneficial to start with large motor (that use big muscles like legs & trunk) activities and then work gradually towards the fine motor (that use small muscles like hand and fingers) skills required for playing the piano when the child masters the skill. Make a giant staff (5 parallel lines) on the floor using yarn,masking tape or an old sheet or tablecloth written on with marker. Have the child place circles (notes) starting on the bottom line and going up the staff 5 notes (line, space, line, space, line) and then back down (a five finger scale) so it looks like a mountain. Then sing this song while holding a toy fish marching up and down the mountain. My (1st, 2nd, 3rd, 4th, 5th) finger on the (right/left). (Wiggle the correct finger on your right or left hand). This introduces in a subtle way the idea of line notes, space notes, steps on the staff, high & low notes finger #s, feeling the beat, and left & right. I might even let the children choose a cute rhythm fish card with basic notes and rests on it from www.susanparadis.com website and name them Mr. Half Note, or Miss Quarter Rest, etc. Once this is easy for the child, we'll switch to moving the fish in the air with our arms like it is climbing up and down the stairs. Next we'll go to the piano and play the first part of the song on the C scale using the 3rd finger supported by the thumb like in the My First Piano Adventures Tigers At My Door Song - (Select the Song & Watch Nancy to Learn How). After observing my son's kindergarten teacher I've seen how you can make any moment a learning moment. So in preschool even snack time will be packed full of learning adventures. Today Dan and I made half notes & numbers out of fruit by the foot. Even after the fruit was gone the paper wrapper was still fun to form into shapes with. Who says you can't play with your food? Pretzels, mini oreos, cheerios and fruit loops can be great to build notes with too. I made some snack placemats with a staff on one side and a keyboard on the other. I'm going to have the students line up their "Snack Notes" on their staff placemats and then practice clapping the rhythms once they are more familiar with the note values. One of the fundamental skills for success playing any musical instrument is to "feel the beat". Every day we will start preschool with some "feeling the beat" activities. Hear are just a few ideas to try at home. Listen to "Friends at the Piano" (on the Faber My First Piano Adventures Lesson Book CD). Tap the beat on your lap or clap. Then vary the motions by tapping lap & clapping. Or for even more fun make animal motions to the beat - clap like a seal, make your arms into a trunk and sway like an elephant, peck your head like a woodpecker, etc. Sing Head, Shoulders Knees and Toes to the Beat of the Metronome. We started really slow w/ metronome at 40 and worked up to 200 beats per minute. Make sure you listen for the speed of the metronome before you begin. For a challenge try it with your eyes closed. I am so excited to start teaching piano preschool next week. Once a week for an hour Dan, Emily and 3 of their friends will get together in a preschool setting to learn piano concepts. Today I did a practice run with just Dan & Emily. It was a lot of fun!